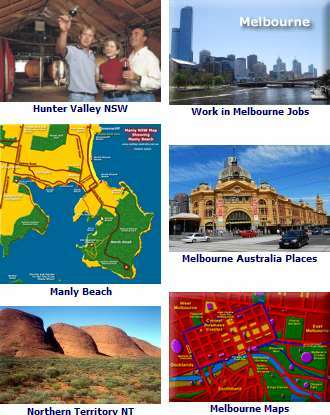 See the Melbourne City Map - Melbourne Hotels Map. 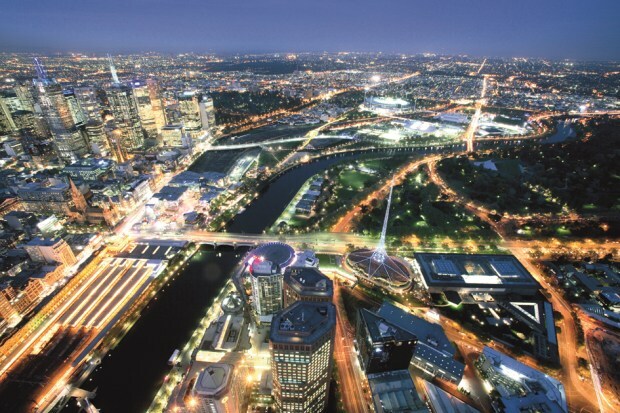 The city of Melbourne Australia, in the state of Victoria, has been voted a number of times as the most livable city and is also home to the Australian Ballet and Australian F1. Melbourne is a treat for those interested in culture, entertainment, great Australian wines, events and festivals and fine dining restaurants offering delicious cuisine, from authentic Australia Bush Tucker to International and noveau combinations of in-between. Located on the shores of Port Phillip Bay and divided by the Yarra River, the first European settlers arrived in 1835. Helped by the prolonged Gold Rush, the little village boomed and within 50 years was a teeming city. Melbourne Australia likes to remember its history and much of its architecture from the prosperity of the gold boom days has been preserved. Parks abound in the city, reminding one of those found in England as well as those in Australia. Check out the Royal Botanic Gardens, one of the finest in the world, with scenic landscapes, colourful flowers and exotic trees. Carlton Gardens has the Royal Exhibition Building and a special playground for kids. See more about the Landmarks of Melbourne Melbourne Landmarks. Cruising the Yarra River, which meanders its way through Melbourne is a good way to see the city sights, but there are also cruises to Port Melbourne and the Docklands, as well as up river to view the River Gardens. Featuring not only Australian native animals, but an exotic collection from all over the world, the Melbourne Zoo is well worth visiting. As is the Melbourne Aquarium, with underwater tunnels giving you full views of sharks, stingrays and myriads of colourful Australian fish. The city has many fine dining experiences. Be sure to check out the Southbank Promenade, with its great selection of restaurants alongside the River Yarra and Hardware Lane. Lygon Street has some excellent Italian restaurants to choose from. More about places to eat Melbourne Restaurants. 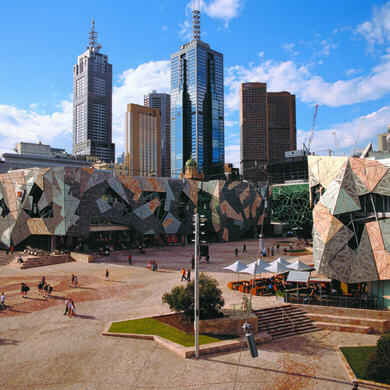 Being the city it is, Melbourne has a great nightlife for those wanting to enjoy entertainment, concerts and live theatre as well as a variety of nightclubs to experience the latest dance and club music. Melbourne also knows how to throw its share of world class dance parties. There is a good selection of Melbourne accommodation, including resorts and hotels to choose from, from the budget to the luxury 5 star. Private apartments are also a great way to stay in the city and of course there are plenty of motels. Find Melbourne Accommodation - Melbourne Luxury Hotels. You can also search for other Victoria hotels and accommodation, complete with traveller reviews, maps, rates, Melbourne tourist information and events. Melbourne Motel, Victoria Hotels and other Melbourne Accommodation - Australia Hotels.